1. This competition is open to all residents of the UK. Entrants who are under 13 years of age will need to get permission from their parent or guardian. 3.The competition opens on 15 May 2014 and closes at 11:59pm on 1 September 2014 19th December 2014. All entries received after this time and date will not be accepted. 4.To enter entrants must submit the URL of their finished Scratch game at https://shaunsgameacademy.co.uk/win.php along with their name, age, Scratch username and any supporting documentation they wish to send. 5.By ticking the tick box on the entry form and submitting it, the entrant agrees to these terms and conditions and to the use of the entrant's personal information as described in these terms and conditions. 6.The Promoter will use the entrant's personal information in order to administer and run this competition. The Promoter may provide the personal information of the entrant to third parties in connection with these uses, but only for this competition. You will not receive any details not relating to Shaun’s Game Academy. k.contain any commercial solicitations, advertising or which promote the services of a competitor. 8.Entries not complying with these terms and conditions or which provide insufficient information on the online entry form will not be accepted by the Promoter. 9.The Winners and Runners Up will be chosen by the 15 September 2014. 10.The Winners will be notified by by email. 11.The Promoter accepts no responsibility for entries that are not received for any reason. 12.Winners' names and counties will be made available after 15 September by sending a SAE to George Rowe, Aardman Animations, Gas Ferry Road, Bristol. BS1 6UN. 13.The Promoter reserves the right to hold, void, cancel, suspend or amend the competition or terms and conditions where it becomes necessary to do so. 14.There is no cash alternative. The Promoter reserves the right to substitute a prize of equal or greater value should circumstances make this necessary. 15.The Promoter’s decision on any aspect of the competition is final and binding and no correspondence will be entered into. 16.The Promoter is Aardman Animations, Gas Ferry Road, Bristol. BS1 6UN. 17. To qualify for the Family competition, a family 'team' must consist of at least one adult and one child between 6-12 years old. Other members are also encouraged to participate without any age limits or restrictions. Family entries should be completed collaboratively with all participating family members. www.shaunsgameacademy.co.uk is a site operated by Aardman Animations Limited ("We"). We are registered in England and Wales under company number 02050843 and have our registered office at Gas Ferry Road, Bristol, BS1 6UN. Our VAT number is GB609301172. 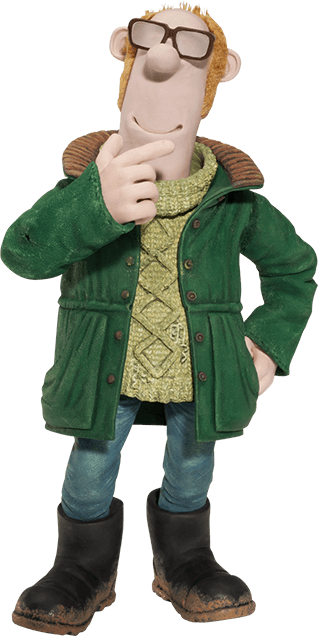 All characters created by Aardman Animations Limited are protected as intellectual property. The following words and their visual depiction are registered trade marks of Aardman Animations Limited: “Wallace & Gromit”; “Shaun the Sheep”; “Timmy Time”.